Franciscan Vocation Ministry » Another Way to Discern Your Vocation: Consider Being a Franciscan Volunteer! Another Way to Discern Your Vocation: Consider Being a Franciscan Volunteer! The process of discernment is never a “one size fits all” process of considering God’s call. Prayer, reflection, having a good spiritual director, and talking over questions and concerns with the Vocation Director are all important. But some young people also desire a volunteer experience which involves them in some key aspects of religious life: living in a prayerful, supportive community and working in a ministry which helps people in need. For 25 years, Franciscan Volunteer Ministry has offered young people the opportunity to live Franciscan life while being of service to a number of communities in Holy Name Province. Fr. Mike Duffy, OFM, director of St. Francis Inn in Philadelphia, relaxes with several Franciscan Volunteer Ministers serving there. It was more than 25 years ago that the seeds of the Franciscan Volunteer Ministry (FVM) were sown. It happened at Siena College in Loudonville, N.Y. In the late 1980’s, three graduating seniors came to the campus ministry to talk about doing a year of volunteer service. The campus ministers — Fr. Jerome Massimino, OFM, and Sr. Rosemary Sgroi, RSM — were delighted. They handed the students pamphlets and brochures from the Jesuits (Jesuit Volunteer Corps), the Maryknoll Missioners, Mercy Corps, and the like. So off the graduates went to Boston to spend an incredible year of service. They returned to Siena with enthusiastic stories about their experience. The next graduating class had eight going to Boston for a year of service; then the following year, there were none. Franciscan Volunteer Minister Chris McNabb brings cheer to a Family during a Christmas party at St. Francis Inn. So the Provincial Council decided to expand the program to recruit from several colleges. 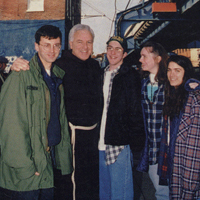 It called together a board with the goal of creating a Holy Name Province-sponsored volunteer program in which the young adults would be living, working, and praying with the friars. The board met every month for more than a year, hammering out all the details: job descriptions, a handbook, developing ministry sites and engaging willing friars to mentor these new lay communities. In September 1989, the first group of official “Franciscan Volunteer Ministers” began their service year. The two ministry sites were Buffalo and Philadelphia. Over the next 25 years, the sites have changed for a variety of reasons. Besides Buffalo and Philly, the Franciscan Volunteers have been located in Boston, Anderson, S.C., Camden, N.J., and Wilmington, Del. Besides Siena and St. Bonaventure University (from where most of our FVMs come), we have had graduates from LeMoyne, Princeton, Boston College, Holy Cross, University of Georgia, St. Anselm’s, and approximately 60 other colleges. Our volunteers have come from San Diego to Lewiston, Maine, and from Seattle to Pensacola, Fla., and everywhere in between. The obvious value of the program is the help they give to the friars in their ministry. They bring energy and youthful enthusiasm to all their ministries. They make possible programs and enhance outreach that the friars may not have the time or skill to do. They also serve as role models for the young. 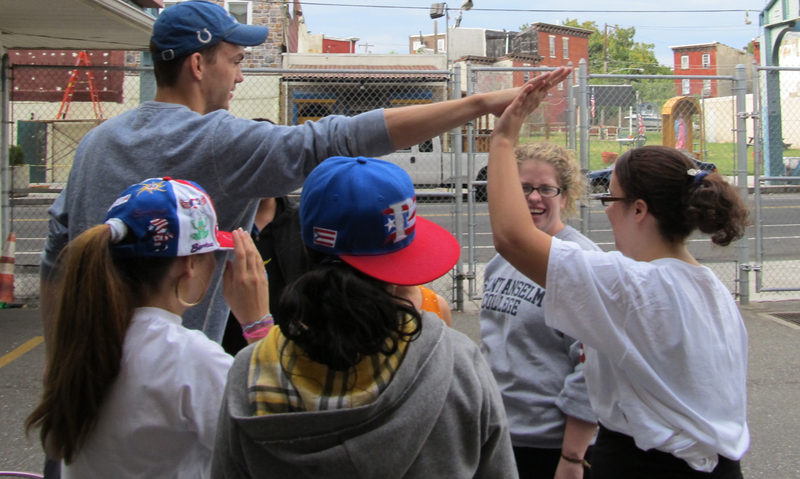 Francis Volunteer Ministers give a high five to a group of young adults. The Franciscan Volunteer Ministry is both a service program and a faith formation program. Because of this, there is another great value that may not be so obvious. The volunteers themselves become transformed in ways that alter their whole life’s journey. They realize the joy in giving, their faith is strengthened, and they begin to see the world in a different light — from the eyes of the poor. They alter their direction in life, they think differently, they make different choices, they change career plans, they vote differently, and they all say they have received much more than they have given. All this in the Franciscan spirit! The Franciscan spirit spreads and is alive in the world today through those who have experienced the FVM program. 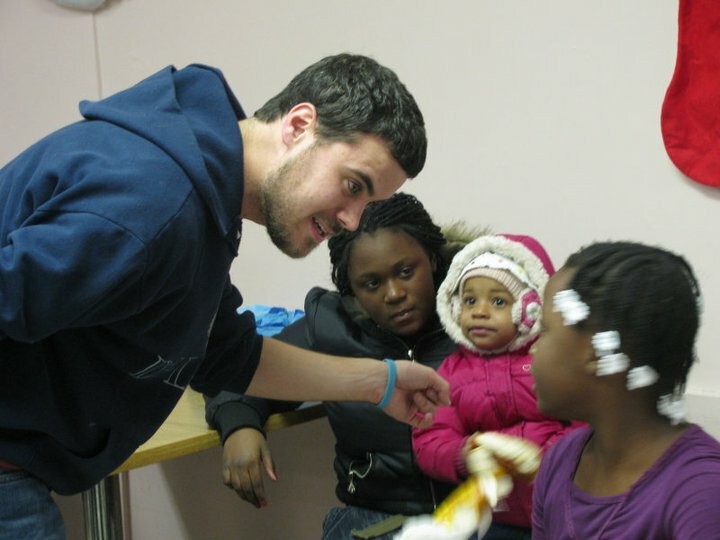 We have had 212 young adults serve as Franciscan Volunteer Ministers. There have been 46 volunteers who have served two years. They are now doctors, nurses, teachers, stay-at-home mothers and fathers, directors of non-profits, parish administrators, campus ministers, university professors, three friars — our own Br. Kevin Kriso, OFM, and Fr. Steve Patti, OFM, as well as one Franciscan Friar of the Renewal — and three vowed religious sisters. And that only begins to list the variety of careers and work that our alums are involved in. So, we thank Holy Name Province and congratulate all the friars and laity who have formed and led this program for 25 years. We ask God to continue to bless the 212 who have passed through the program and are now spreading the Franciscan spirit in the world. Happy 25th anniversary! Fr. Michael Duffy, OFM, a native of New Hampshire, is director of St. Francis Inn in Philadelphia, where he has been stationed since 1987. The above reflection was adapted from an article that appeared in the Nov. 20, 2013, issue of HNP Today, the Province’s bi-weekly e-newsletter.